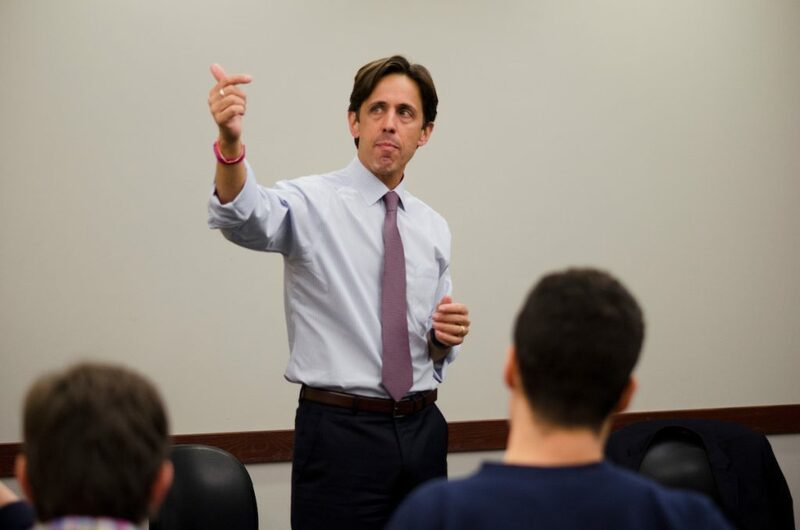 David Simas, special assistant to President Barack Obama and director of the White House Office of Political Strategy and Outreach, spoke to a group of about 25 people in Dowling Hall yesterday during the last of the semester’s Civic Life Lunch events sponsored by the Jonathan M. Tisch College of Civic Life. Dean of Tisch College Alan Solomont began the discussion by introducing Simon Rosenberg (LA ’85), founder of the New Democrat Network and member of the Tisch College Board of Advisors, who is also a friend and colleague of Simas. Rosenberg described Simas as a “rare creature” in Washington because of his ability to keep his colleagues grounded and remind them of the importance of public service when such work becomes particularly difficulty. After thanking Solomont for his service to the country and Rosenberg for his help and friendship, Simas reflected on the remaining 43 days of Obama’s presidency and all that had been accomplished over the previous eight years. Though Simas was pleased with the progress made by Obama and where he has taken the country, he expressed fears about the current political climate. He did not speak at length about the outcome of the election and President-elect Donald Trump but rather about his observations of a pervasive rejection of facts and increased personal and social stratification as products of political division. Simas explained that some of the polarization was due to technology and social media allowing individuals to surround themselves with like-minded people and opinions and to rarely hear disagreements on their points of view. According to Simas, this has begun to jeopardize the idea of objectivity, which holds serious repercussions. “There was a focus group I saw a couple of weeks ago where I was depressed. Not because of what people were saying about the candidates but because … they didn’t believe a thing about anything that they were hearing in the news. There were no facts. There was no truth … and when nothing is true, everything is true,” he said. According to Simas, election rhetoric has exacerbated these problems. “The ability to see each other is becoming increasingly difficult … People are beginning to say things like, ‘I don’t even understand how they believe what they believe.’ And once you have that level of abstraction where it’s not your neighbor or fellow American and it becomes ‘the other,’ then the coarseness of our politics goes into a cycle [where] frankly, given the way elections run, those fissures are deepened,” he said. Simas repeatedly stressed personal connections and genuine listening as effective strategies to transcend the chasms that have grown between people on a social level as a result of political divisions. In an interview with the Daily, Simas said that people increasingly define others purely based on whom they voted for or their political party rather than taking in the person as a whole. This comes along with a presumption of someone’s motives for voting one way or another, he said, which engenders polarization and a lack of empathy into how people approach politics. “This is why listening, true listening, is so much more important, rather than simply dismissing someone as a Clinton voter or a Trump voter. The more important thing is the underlying ‘Why?’” he said. He continued by saying that a university setting is ideal for different points of view to be expressed and explored but that this necessitates a determination to listen and understand a different perspective.